As explosions tear through the chemical facility, large plumes of smoke and toxic gas rise skyward. Anyone caught in the blast area would either be killed or seriously injured. With fires that could burn at 2,000 deg C, firefighters could take hours trying to get it under control. Sending rescuers into the disaster area would also mean they could end up as casualties. That is why the Singapore Civil Defence Force (SCDF) will be using unmanned vehicles to help fight such fires. At yesterday's Workplan Seminar, an annual platform for the SCDF to lay out plans for the year ahead, it unveiled several new types of equipment. The SCDF recently bought four remote-controlled unmanned fire-fighting machines (UFM), which will be deployed at different stations. One, already stationed at Jurong Fire Station, was brought in three weeks ago, said Major Ivan Kwok, project team leader for the UFM. While it has not been deployed to fight any fires here yet, it is already operational. The remaining three will arrive in July and will be deployed at Jurong Island, Yishun and Changi fire stations. The Austria-made vehicles will likely be used in high fire load situations, such as industrial or petrochemical fires where there may be a lot of combustible material, Maj Kwok said. He added that the four fire stations were chosen because of their proximity to high risk areas and because they can best cover the whole of Singapore. 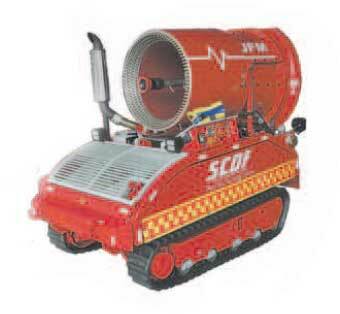 The UFM is the latest addition to SCDF's arsenal. It help frees up critical tasks of frontline responders so they can attend to rescue and evacuations. It has sensors and detectors for Hazmat monitoring and surveillance. 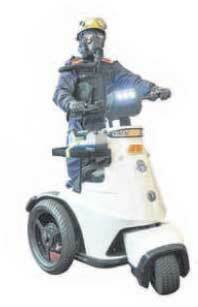 It is used as a means of transport for staff to quickly identify the safe and danger zones around the incident. Automatically following a track marked out by tape or painted lines, this prototype can carry loads of up to 150kg. it will stop when it detects an obstacle. This prototype provides quick conveyance of non-ambulatory casualty from personnel decontamination point to the first-aid point. 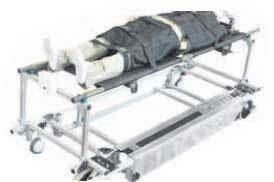 easily set-up by two responders, it can transport casualty at 2m per second, faster than normal walking speed. This frees up the manpower that is normally needed to carry the casualty. The new compact and agile vehicle has a bigger foam tank (150 litres), auto transmission, 3-litre turbo diesel engine, motorsports roll-over cage and 2 sets of backpack Compressed Air Foam (CAF).